It’s chilly up north this Winter, so we are heading south of the border in search of warmer climes and to spread the love of books as the Scottish Friendly Children’s Book Tour goes to Liverpool with the brilliant and colourful illustrator and author Nick Sharratt! 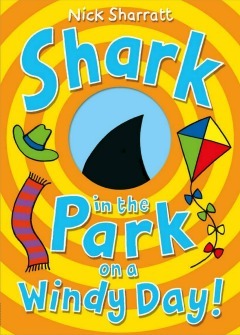 To celebrate Nick’s upcoming tour, we are giving away a signed and dedicated copy of his Bookbug Picture Book Prize winning book Shark in the Park on a Windy Day! Which of these shark facts is false? The closing date is Wednesday 1 February. To enter please add your answer as a comment below along with your name, who you would like the book to be dedicated to and email address. View full terms and conditions here. Nick studied Graphic Design at St Martin’s College where he honed his drawing skills before becoming a freelance illustrator. His first published book was an educational textbook in 1987 and has been hooked ever since, he has now illustrated close to 250 books. He has worked with authors including Julia Donaldson, Michael Rosen and most notably Dame Jacqueline Wilson and has also written around 40 of his own books, including the wonderful Shark in the Park on a Windy Day! Nick was the official illustrator for World Book Day in 2006 and I have a fellowship from Hereford College of Art and is extremely proud of his gold Blue Peter badge. Nick was the official illustrator for World Book Day in 2006! Nick entered an art competition on the back of a cereal package and won! His work was featured at Liverpool’s Walker Art Gallery. Nick wrote a book called ‘socks’ and can always be found wearing a brightly coloured pair! Dame Jacqueline Wilson famously knew he was the right illustrator for her books when they met and she noticed his bright yellow socks! Just when you thought it was safe to go back in the park . . . Timothy Pope is blown this way and that way in the windy park — but among the whistling wind and blustering brollies could that be a shark he spies through his telescope. Peep through the die-cut hole in the pages of the book to find out. 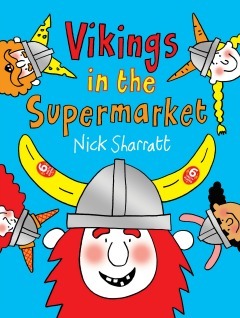 Six Vikings on a shopping trip, one tartan patterned cat, a clever little mermaid, a naughty vampire bat, the queen who’s really fond of green, the pirate Tidy Clyde: Open up this jolly book and meet them all inside!